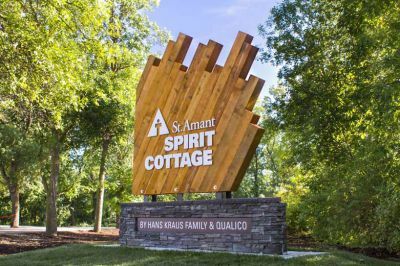 Relish, a graphic design and branding company out of Winnipeg, Canada, designed the exterior signage for the St. Amant Spirit Cottage by Hans Kraus Family & Qualico. The cottage is a recreational retreat for children with developmental disabilities and their families. The signage is featured on the driveway leading up the cottage and is the first brand interaction visitors have with the facility. As an ode to St. Amant’s existing graphics, the design for the signage mimics the rays of color seen in the company’s logo by using cedar timbers in various lengths. The sign was built by the sustainable advocates at Wood Anchor who work with reclaimed woods in an array of applications including furniture design. In addition to the cedar, the sign features Dibond aluminum composite lettering, which creates a beautiful contrast between the two materials. The use of natural materials, like cultured stone and reclaimed timber, along with a more modern aluminum composite material, allow the sign to blend in to the natural riverside surroundings in addition to providing the welcoming warmth associated with the cottage’s purpose.